Deluxe Room Description: Contemporary elegance and Sardinian tradition melt into a unique style mix in the elegantly refurbished Deluxe Rooms. Deluxe rooms come equipped with air conditioning, wi-fi, satellite TV, minibar, safe, beach towels and bathrobes and measure between 22 and 28 sqm. Rooms can be either a double bed or two single beds. An optional extra bed or cot can be added in some rooms upon request. Family Classic Room Description: The Family Classic Room (about 52 sq.m.) consist of a large bedroom with an independent bathroom and a living room with a French sofa bed (140 x 180) with a second bathroom & shower. The bedroom and the living room are separated by a door. All Family Classic Room have a small terrace, and all have satellite TV, wi-fi, air conditioning, minibar, safe, beach towels and bathrobes. Most of them have a partial sea view. Garden Deluxe Room Description: Contemporary elegance and Sardinian tradition melt into a unique style mix in the elegantly refurbished Garden Deluxe. 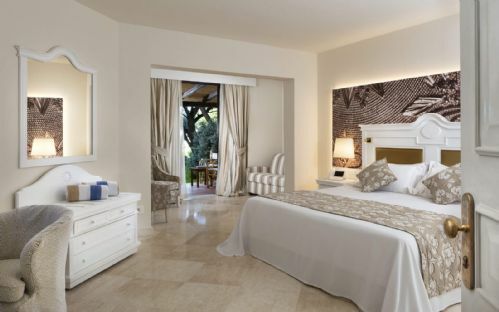 These rooms are ground floor with direct access to the garden leading towards the white sandy beach. Garden Deluxe come equipped with air condition, wi-fi, satellite TV, minibar, safe, beach towels and bathrobes and measure between 28 and 32 sqm. They can have a double bed or two single beds. Some have a sofa bed in order to accommodate 3 persons. Limited sea view due to the vegetation of the garden. Garden Family Deluxe: (50-60 sqm) are totally refurbished, ground floor, and are composed of 2 bedrooms and 2 bathrooms. 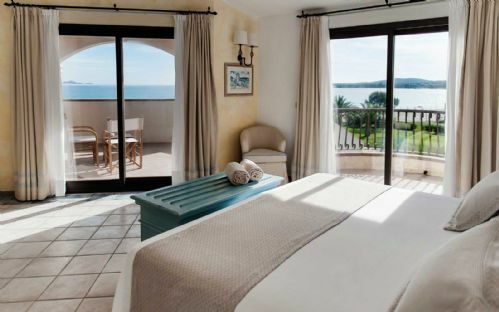 One of the room is sea side with a patio for direct access to the garden and the beach. 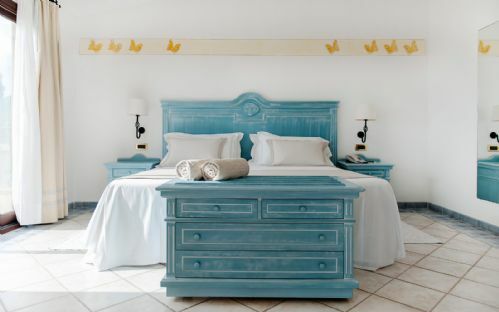 They can sleep 2-4 people and are finely furnished in Sardinian style, with warm and elegant colors. The sea view is limited since the room is ground floor. 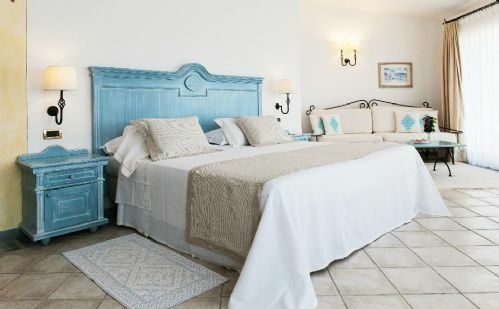 Junior Suites Description: The spacious Junior Suites (30-40 sqm) feature a bedroom with sitting area and a balcony which offers stunning views over the crystal waters of the Gulf of Marinella. One of the ground floor junior suites even has a patio with direct access to the Mediterranean garden. They come equipped with with air condition, wi-fi, satellite tv, minibar, safe, beach towels and bathrobes. Junior Suites are outfitted with a double bed or two single beds. Standard Room Description: The comfortable and welcoming Standard Rooms (18-25 sqm) face the garden or the hill side and have lovely Sardinian furnishings. They come equipped with air conditioning, wi-fi, satellite tv, minibar, safe, beach towels and bathrobes. 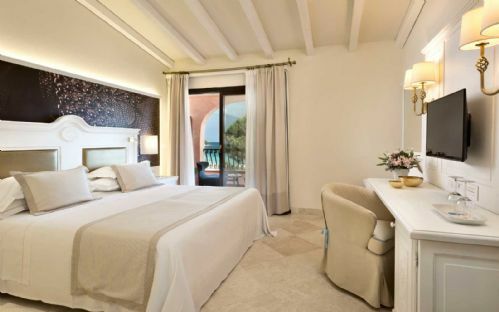 Superior Room Description: Set against the stunning backdrop of the Golfo di Marinella, Superior Rooms (18-25 sqm) have balconies or garden floor patios with amazing views of the emerald sea. They come equipped with air condition, wi-fi, satellite TV, minibar, safe, beach towels and bathrobes.